Warm Grilled Potato Salad with Lemon and Oregano. A tasty, warm grilled potato salad with plenty of bright fresh flavours in the dressing and finished with some crumbled feta cheese. As regular readers will know, our family practically lives off the backyard grill in the summer months. With the season so short here in Newfoundland nobody could blame those like us who need to take as much advantage of the good weather as we possibly can. We are going to be concentrating more on great side dishes during this summer and this delicious warm potato salad was a big hot at dinner a couple of days ago. It is so simple and easy and comes together quite quickly too. Red or yellow potatoes are best for this recipe because they hold together better and keep their shape when par-boiled and then grilled. After grilling to golden brown it is then a simple matter of tossing them with the few other tasty ingredients before serving. We crumbled feta cheese over this particular salad but it is not essential to the recipe. If you don’t like it or you can easily substitute freshly grated Parmesan or other hard cheese if you wish. The grilling of the potatoes is the most important element here. 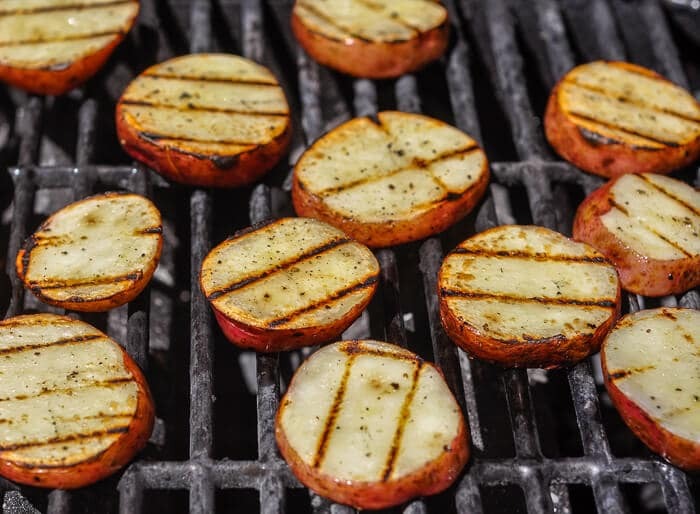 You can rally make many different grilled potato salads using this method. We often add chopped olives and red onion to this one for additional Greek flavours. Use this idea to come up with other great flavour combinations with unique dressings to make other ideas come alive. Maybe bacon, parmesan and garlic with Caesar dressing? OH, now I can’t wait to try this one myself! Like this Grilled Potato Salad recipe? You’ll find hundreds of other great ideas in our Side Dish Recipes Category and even more in our BBQ & Grilling Category. 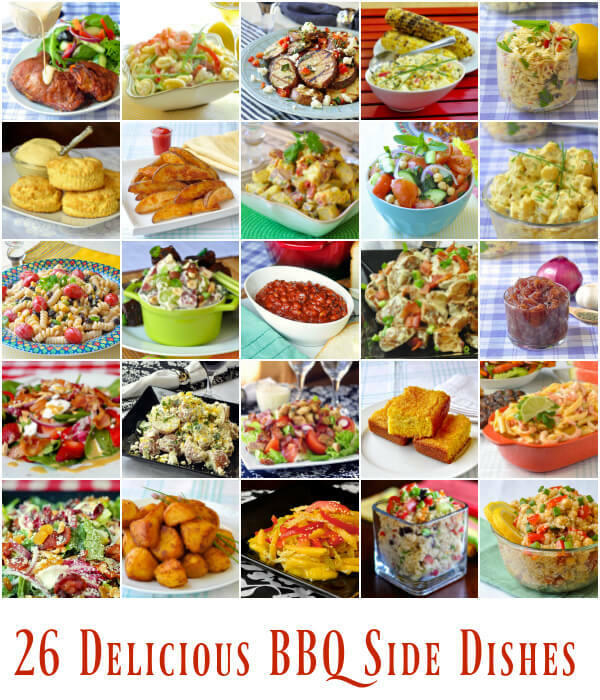 Also, be sure to check out this collection of 26 Best Barbecue Side Dishes. Bookmark that page to try them all summer long! 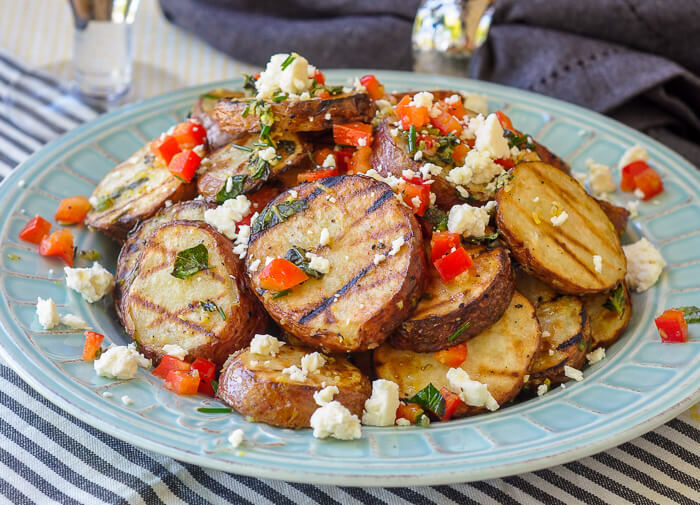 Warm Grilled Potato Salad with Lemon and Oregano - A tasty, warm grilled potato salad with plenty of bright fresh flavours in the dressing and finished with some crumbled feta cheese. Cut the potatoes into ½ inch slices and gently par-boil them in lightly salted water for 4 or 5 minutes or until a fork can be pushed through a slice but it is not soft and fully cooked. Drain the potatoes and let them cool on a clean tea towel in a single layer. When they are cool enough to handle very lightly brush each side of the potatoes with the olive oil and lightly season with salt and pepper. Grill on medium heat until they are golden brown, fully cooked and fork tender. Remove from the grill and place in a large heat proof bowl. Whisk together the 2-3 tbsp extra virgin olive oil, diced red pepper, lemon juice and zest, oregano and chives. pour over the grilled potatoes and toss gently until the potatoes are fully coated. Transfer the potatoes to a serving platter and crumble feta cheese over the top if desired when serving. Sorry, thanks for catching that. The recipe has now been updated to include the diced red pepper. As with all your Recipies, this warm potato salad sounds DELISH!! What a great side.